The mixed double competition is limited to 40 teams. EuroPadel, Waterloo Padel Club and Padel4U2 members will participate at preferential rates. Contact info@europadel.net if you are looking for a partner to team up with. Each team will play at least four games. Everybody can join us at the Saturday evening BBQ and Party with a DJ. On Sunday we will serve paella and later we will organize a big tombola during the closing ceremony with great prizes. Individual tickets for the BBQ on Saturday and the Paella on Sunday will be available from the catering service on site. Padel 4u2, Emanuel Hielstraat 108, 9050 Gentbrugge. Please mention the PLAYERS NAMES in the payment reference. Also send an e-mail to info@europadel.net confirming the payment and the players’ name, e-mail and telephone number, indicating if players are members of EuroPadel/Waterloo Padel Club/ Padel4U2 or not. VERY IMPORTANT: In the e-mail please confirm if you will attend the BBQ Saturday evening and the Paella Sunday midday, indicating the number of people. You will pay on the spot. Last day for inscription June 16th, so do not wait till the last minute. If we receive more requests than vacancies (40 couples), we will proceed on first-come first-serve basis. EuroPadel 5th Anniversary Party !!! Mamma Mia !!! 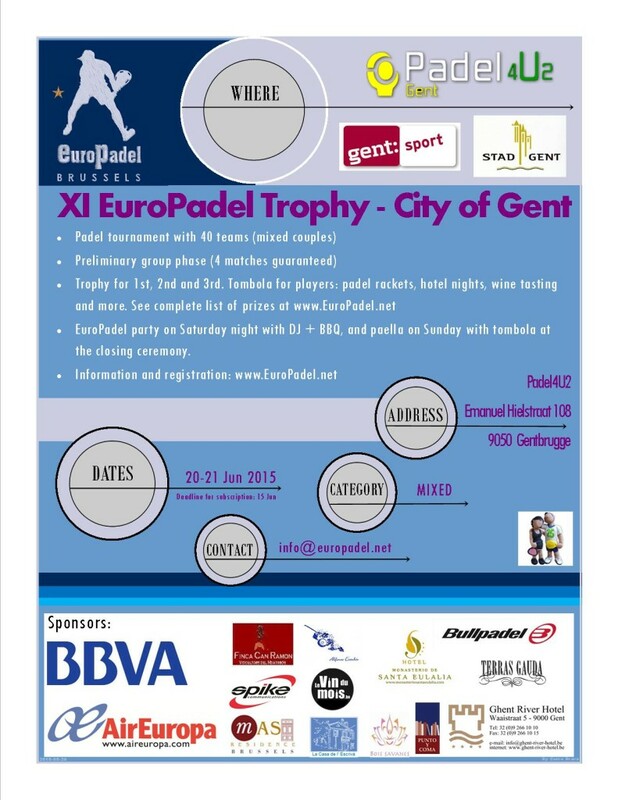 4 Replies to "XI EuroPadel Trophy – City of Gent"
I would like to start into padel, but they say you have to run a lot, is that true? Me apunto ya mismo! El torneo de EuroPadel en Gante es archifamoso en el mundo del padel! Yo quiero salir en el Hola!